In the counsel of the Godhead. Before the creation, not only was a Lamb slain before the foundation of the world, the intention of God was to dwell in the midst of His people. According to this purpose He fashioned a garden eastward in Eden. And there He placed the man and women He created. His only covenant law was to refrain from partaking of the Tree of Knowledge of Good and Evil. They could eat as often as they desired from the tree of Life, and live, however He warned them that they would die in the day they ate from the fruit of the mingled tree. They partook of the tree by an act of their own will, and fear entered into man who tried to cover himself with fig leaves. When God came in the cool of the evening He slew and innocent animal and made them coats to cover their nakedness. Man no longer was the image of God, as their spirit died in the day of their transgression and were banished from the Garden. Cherubim's came with flaming sword to guard the way to the Tree of Life. God promised Eve that of her seed a man child would be born that would crush the head of the serpent, which deceived them. Adam knew his wife and she born of him twin sons Cain and Abel. When Abel offered a blood sacrifice that was accepted of God, Cain rose up and slew his brother in a jealous act, because the fruit of the earth offering he brought before the Lord was not accepted. Then Eve bore a son called Seth and men once again called upon the name of the Lord. As the generation passed God raised up men who found favor with Him from Noah to Abraham. When God cut covenant with Abraham He told him , his seed would be servants in a strange land for four hundred years. This came to pass in the days of Joseph ( son of Jacob) when he was sold into captivity to a military leader in Egypt. God blessed him there, and he rose second in power to Pharaoh, through the Spirit and Grace of God. When Israel came into Egypt at the invitation of Joseph, they were treated as special guests and given the choice land of Goshen. After Pharaoh's death another king arose that knew not Joseph and enslaved all of Israel , who had multiplied greatly by the hand of God. God raised up Moses as a deliverer and brought them out to freedom by a mighty hand , with many miracles. After crossing the sea and going into the wilderness God appeared to Moses and all Israel giving them the Ten Commandments. The Israelites asked Moses to intercede because they feared the voice of the Lord. God called Moses up into the mount and with His finger wrote the 10 Commandments on tablets of stone. He then gave Moses a detailed plan for the construction of a Sanctuary so He may dwell in the midst of His people. He commanded him, (see that you make it according to the pattern that I have shown you on the mount). God called Bezaleel of the tribe of Judah and filled him with the Spirit of God, and wisdom, and understanding, and knowledge to work in silver, gold, brass, and stone work. He also gave Aholiab of the tribe of Dan to aid the Man of Judah. 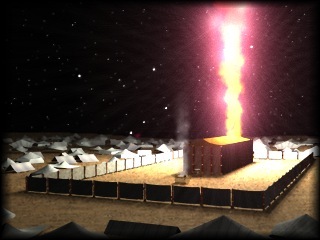 It is so important to note that it took a man of Judah ( from which our Lord sprang) , and a man of Dan ( righteous judgment of God) , to build a tabernacle where God would meet with His people. For this purpose Jesus made it plan that we where His temple and He dwelled in the midst of us by His Spirit. In this 150 x 75 ft. structure that is completely encompassed with a white linen curtain, there is only one entrance and it faced east. The door to this entrance was a curtain with four colors. The linen curtains of the door was of blue, red, purple, and white ( signifying the four gospels, which portray Jesus Christ as the Lord from heaven - blue, the suffering Savior - red, the King of Glory - purple, and the righteous Son of God - white .) It stand to reason this is the only way to enter into the presence of God. The first item a worshiper confronts is a Brazen Alter, which foreshadows the cross of Christ. One must have blood applied here to progress further into the presence of God. The fire came from God to consume the sacrifice and God spoke to the priesthood to keep it burning. After the blood is applied you proceeded to a Brazen Laver filled with water from the rock. Brass always means judgment in the scripture. At this laver the High Priest and his son's washed their hands and feet before entering into the Sanctuary called the Holy Place. This foreshadows the washing of the water by the Word after the blood is applied for cleansing of original sin. Upon entering the Holy Place the worshiper sees a Golden Lampstand that first shines on and reveals himself, and is located on the southern side of the structure. This light also reveals a Golden Table of Shewbread, which is to the north side of the room. A slender Golden Incense Altar stands in front of a curtain that has two Cherubim woven into the veil with golden thread, (they still guard the way of the Tree of Life). We have come out of natural light and the stench of blood to a softly lit room with the sweet savor of incense. Those outside only see a curtained tent of badger skin, underneath this protective covering is ram skin died red, black goat skin and then the white seen by the worshiper in side the sanctuary. Everyone of these are types and shadows of our Lord and His work. The inside walls of the structure are acacia wood covered in gold. The soft light of the candle stick gleams with a beauty of gold and white every where you look. And a veil directly in front of you. Behind the veil is a small room with only one article of furniture . It is a gold covered ark with a solid gold Mercy Seat that holds the Tablets of the Covenant, Aaron's Rod that Budded and the Golden Pot of Manna. Here God met with Moses any time he was called there and Aaron once a year. See the beauty of the presence of the Lord seated on a golden seat with two Cherubim with wings out stretched over Him. No wonder David would say, " Under thy wings, I have come to trust." When looked upon from an aerial view the six articles formed a cross with the Ark of the Covenant being in the place where Christ's head rested on Golgotha cross. Is it any wonder that Balaam could not curse these people? As we go through the structure piece by piece we will learn how to progress from sin to the perfection God intends for us to be when He gave a five fold ministry to bring the church into His stature as a perfect man. It is easy to see that our sins are taken as far as the east is from the west, since this sanctuary is approached from the east and proceeds to the west. This teaching will give you the placement of the tribes around the sanctuary, the placement of the priesthood around the sanctuary, the banners under which they camped and marched, and why they where placed in that order. We will also learn the five offerings that cleanse and bless the worshiper. We will learn the garments of the Priesthood and how it is applied to us today. Since 50 chapters of the Bible is given to the detailing of the Tabernacle (more than any other subject in the Word) it is to our benefit to learn and apply this teaching to our walk.